The Nationals agreed to sign free agent closer Rafael Soriano to a two-year, $28MM contract, Yahoo's Jeff Passan reports (Twitter links). Soriano will receive $7MM in 2013, $7MM in 2014 and the remaining $14MM in deferred payments from 2018-2025, reports Jim Bowden of ESPN.com (via Twitter). The deal includes a 2015 option valued at $14MM that will vest if Soriano finishes 120 games over the course of the next two seasons. Agent Scott Boras represents Soriano. Soriano posted a 2.26 ERA with 9.2 K/9, 3.2 BB/9 and a 35.9% ground ball rate for the Yankees this past season. The 33-year-old saved 42 games, reaching the 40-save plateau for the second time in three seasons. He ranked 17th on MLBTR’s list of top 50 free agents entering the offseason, and passed on two contracts that were available to him earlier in the winter. He opted out of his existing contract with the Yankees then declined New York’s qualifying offer. 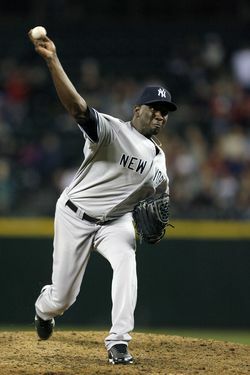 The decision to decline the Yankees’ qualifying offer linked Soriano to draft pick compensation. The Nationals will lose a draft pick for signing Soriano, and the Yankees will obtain a compensatory selection for their loss. The Nationals stand to lose the 29th overall selection, while the Yankees are now poised to gain the 32nd overall selection, Jim Callis of Baseball America notes (on Twitter). Throughout the process Boras insisted he’d find a favorable deal for his client. Soriano's deal resembles the two-year, $30MM contract Mariano Rivera signed with the Yankees before the 2011 season. Non-relievers such as Ryan Dempster, David Ortiz and Torii Hunter signed two-year deals worth a comparable amount earlier this offseason, as MLBTR's Free Agent Tracker shows. Soriano joins a Nationals bullpen that includes right-handers Drew Storen, Tyler Clippard, Craig Stammen, Ryan Mattheus and Henry Rodriguez. Washington doesn't boast much established left-handed relief after losing Sean Burnett, Tom Gorzelanny and Mike Gonzalez to free agency. Boras represents a number of Nationals players, as MLBTR's Agency Database shows. Bryce Harper, Danny Espinosa, Anthony Rendon, Stephen Strasburg and Jayson Werth are also clients of the Boras Corporation. Nationals owner Ted Lerner was "heavily involved" in bringing Soriano to Washington, Adam Kilgore of the Washington Post reports. The Dodgers were also in the mix for Soriano, MLB.com's Jesse Sanchez reports (on Twitter). The Yankees never engaged Soriano after he declined their qualifying offer, Jon Paul Morosi of FOX Sports reports (Twitter links). Tigers GM Dave Dombrowski told Morosi that Detroit "did not seriously pursue" the reliever either. Michael Bourn and Kyle Lohse, two other Boras clients, are now the lone remaining free agents still linked to draft pick compensation.